In tidy Denmark, in tidy Copenhagen, in tidy Christiansborg Slot, I learned just how, well, tidy, the Danes like to keep things when I was required to don a pair of protective blue-cloth footwear before starting my tour of this castle in the heart of the city. The Queen’s Library holds 10,000 books for the royals to leaf through. As I joined a group of what was starting to resemble a flock of blue-footed boobies, the practical reason for the precaution became obvious: to protect the castle’s polished floors. But I wondered if the real reason had more to do with the Danes constantly having to clean up this site over the centuries, and they were simply tired of it. The current castle is actually in its fifth incarnation. The first was the Bishop’s Castle, a fortress built by Bishop Absalon in 1167 after his foster brother, King Valdemar the Great, granted him the town of Købmædenes Havn (“Merchant’s Harbor,” today “Københaven,” or “Copenhagen”). His castle stood until 1369, when it was demolished and replaced by Copenhagen Castle, which, in turn, lasted until 1731, when Christian VI had it torn down. He built the first Christiansborg the following year, but a fire destroyed most of it less than a century later. A second Christiansborg went up in 1803. Thirty-five years after the Danish constitution was adopted here in 1849, it, too, burned down, and only the chapel remained. Given that history of messiness, I was sure the Danes wanted Christiansborg 5.0 to last so as not to undergo all that demolition, sweeping up, and rebuilding again. So, with nearly half a million visitors — from local schoolchildren to international tourists — traipsing around the castle every year, it’s no surprise that the Danes do everything they can to preserve their country’s most important building. It is the only building in the world that houses all three of a country’s branches of government: executive, judicial, and legislative. 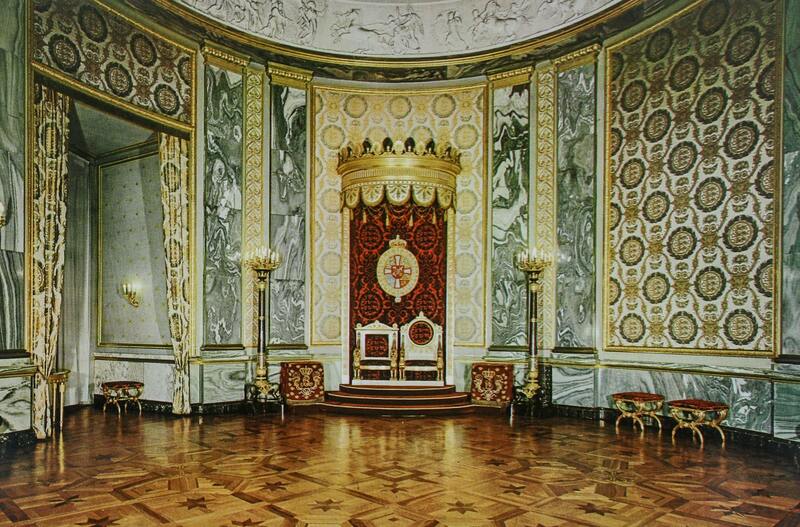 The royal family maintains a presence here as well, and it is their rooms that particularly stand out. A cozy dinner for 50 can easily be accommodated in the tremendous Dining Hall. 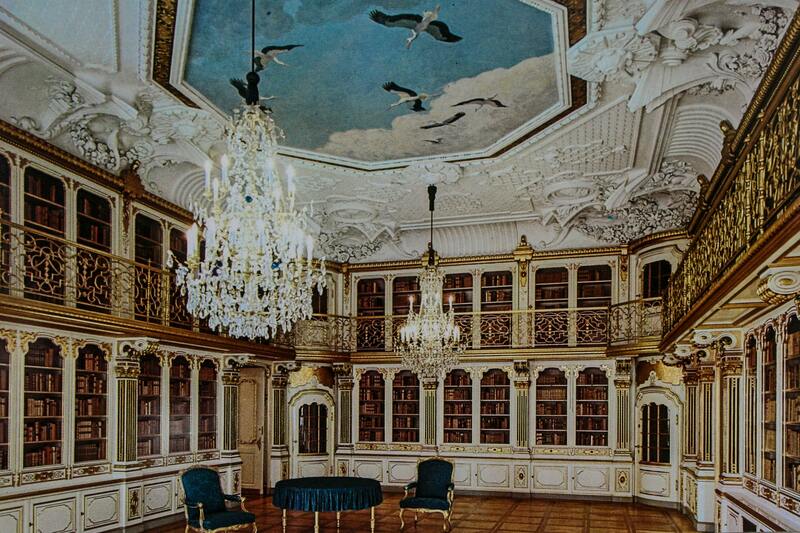 The Queen’s Library, for instance, houses 10,000 books (a small percentage of the full royal collection) in a two-story room with gilded bookcases, crystal chandeliers, an elaborate plaster ceiling, and a ceiling mural of swirling cranes against a light-blue, partially cloudy sky. In the neo-classical Palace Chapel, large enough to be a separate free-standing church all on its own, members of the royal family are baptized and married under the coffered dome and amid the deceptive scagliola walls and columns. The heavily ornamented Alexander Room features “Alexander the Great Enters Babylon,” a frieze with hundreds of figures that wraps around the entire room. Portraits of Danish kings line the walls of the tremendous Dining Hall, anchored by a table that can comfortably seat 50 for a lavish dinner under two tremendous crystal chandeliers. Although Denmark is one of the most egalitarian countries in the world today, a little feature in the Throne Room reminded me that, once upon a time, men (and certainly women) were definitely not equal. 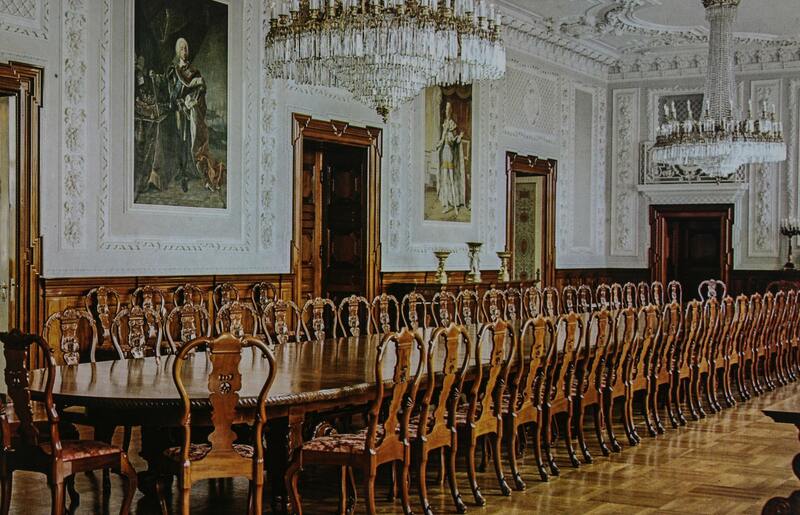 In the center of the room, a singular design in the wood floor indicated where those addressing the royals should stop before greeting their highnesses on their throne and giving obeisance. When they concluded their business, they would walk in reverse so as not to show the king and queen their back as they left. Funny how things have changed: Now, Parliament possesses all the power, and the reigning monarch, currently Queen Margrethe II, must sign off on every law that Parliament passes (it’s not a law until she does so), no matter what it is, even if it’s to abolish the royal family. I doubted whether the Danes would ever want to take that revolutionary step, especially in light of the current queen’s highly regarded reign. Margrethe II (only the second Danish queen ever; the first Margrethe ruled back in 1387–1412) has been the queen for more than 40 years now and has reputedly never sat on the royal seat in the Throne Room, preferring to greet visitors in a less hierarchical manor. Aside from not behaving like, well, a queen, she’s not an idle royal, either. As an accomplished and often exhibited artist, she has designed several Danish postage stamps, illustrated books, costumes for the Royal Danish Ballet, and lithographs for the Danish Red Cross. Her illustrations were used as the basis for the covers of the Danish version of The Lord of the Rings in the early 1970s, after the author J.R.R. Tolkien himself expressed his pleasure with them. Visitors to the castle would greet the king and queen on their throne from this spot, but the current Queen Margrethe II prefers a less rigid reception. The Great Hall also bears faux marble on the walls. One of the striations shows a profile of the queen, and another contains a crown with “M2” under it, but unless someone points them out (as my guide did), they would be virtually impossible to locate. Once we completed the tour and discarded our protective footwear, the guide invited us to venture down on our own to the subterranean levels of Christiansborg to see the remnants of the two earliest versions of the castle, which have been open to the public for 90 years. I was the only one to take up the offer, and I soon found myself alone, wandering amid the ruins along dimly lit passageways and chambers. Small spotlights illuminated key displays, such as the relics of an early indoor plumbing system: a hollowed-out log. I could almost hear the ghosts of 900 years of Danish history as I walked around, my footsteps echoing in the unoccupied space. The whole experience would have been rather eerie if not for the fact that the entire section of archaeological and historical ruins was kept, as I now fully expected, tidy.